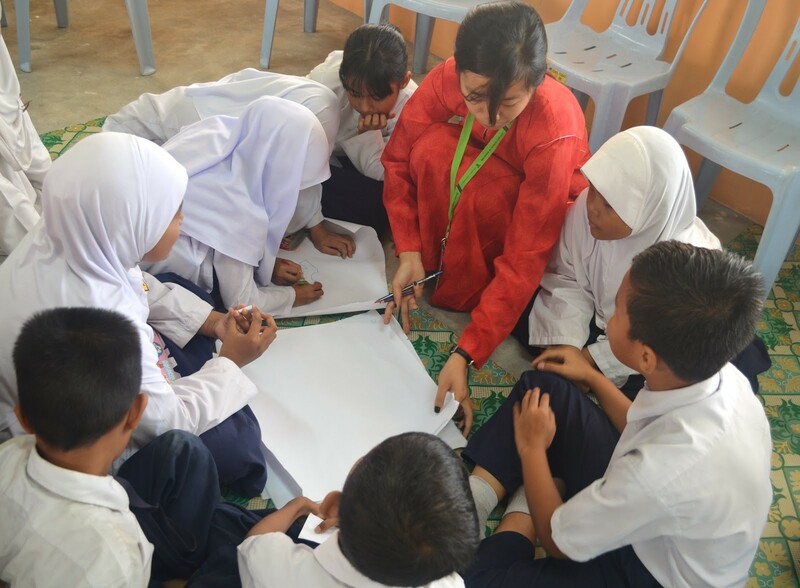 Sekolah Kebangsaan Kampung Lindungan (SKKL) belongs to the category of primary schools that most people would label ‘underachieving’, ‘lazy’ and ‘unenthusiastic’. 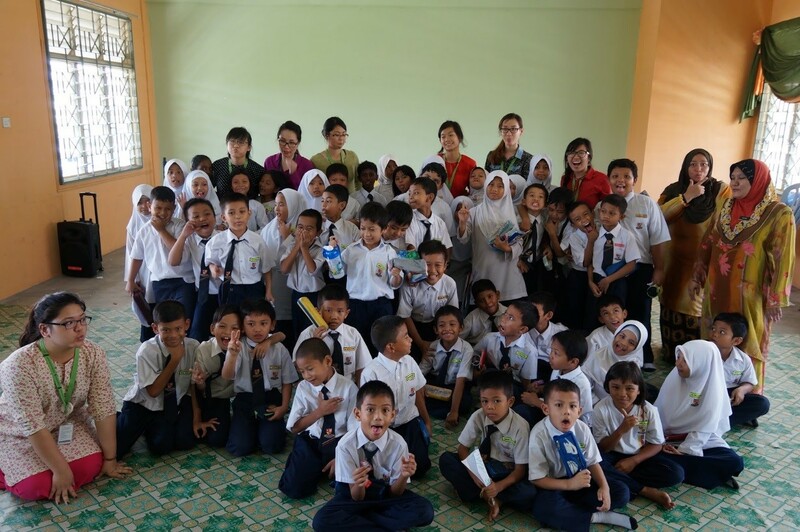 This was the school in which we, six student teachers from Taylor’s University Lakeside Campus’ School of Education, conducted a workshop as part of our social action project in the module Education and Society. 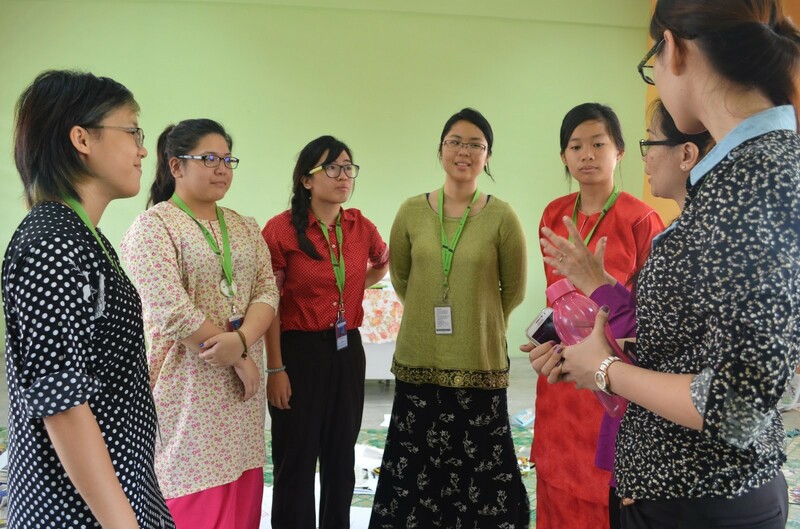 At 8 o’clock on the morning of 28 May, the workshop was kickstarted with an introduction by the facilitating lecturer, Dr Cheah. She then split the Standard 1 and 2 children into six groups, led by each student teacher present. After getting to know more about the students, we started our main activity, which was guiding the children in making ‘My Big Book’. 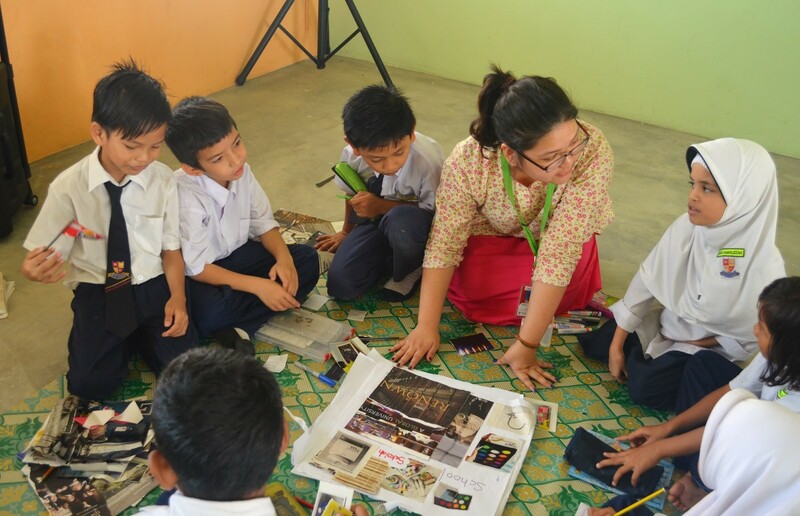 Cikgu Ashley helping the students make the butcher paper into a four-piece, eight-page book while talking them through the process. Each group got a piece of butcher paper and some stationery, and by folding the paper in half twice, created an eight-page big book. When the students had chosen the theme for their book, the student teachers guided them in brainstorming words related to the theme then including those words in the book by writing, drawing and pasting pictures. 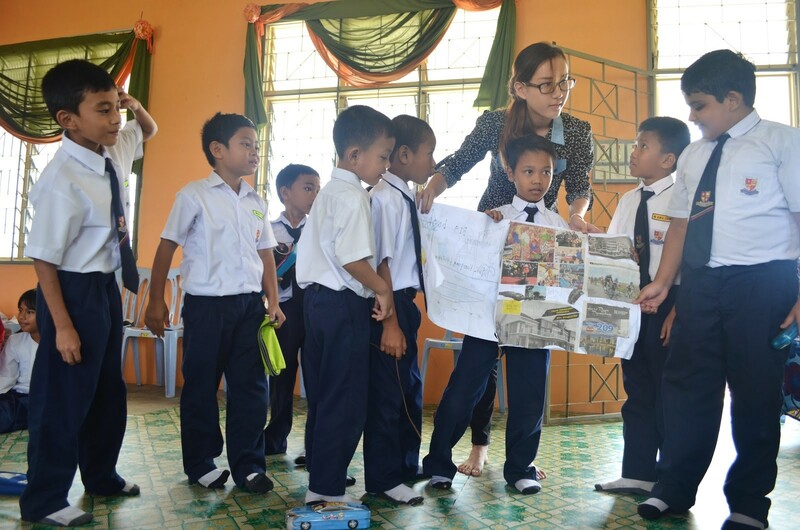 Initially apprehensive, the children started warming up to us and the idea of making a book. Upon realizing that we did not shoot down their ideas and were encouraging them to do what they thought best, the dam of ideas broke and overflowed. Even when we stopped for their morning break, many asked if they could still work on their books after the break. ‘My Big Book’ under construction! Work on the big books continued with gusto after the break, as the students cut, pasted and wrote fervently, hoping to complete their books in time for the presentation at the end. It was a beautiful sight (and sound): pieces of paper strewn across the class, colour pencils running amok and the clamour of voices discussing ideas and asking questions. Soon, it was presentation time. As the slightly nervous and excited children presented their books, it was so clear that they were proud of their creations and were trying their best to explain it. Book after book were filled with pictures cut out from magazines, drawings, words, but most of all, they were filled with laughter, hard work and moments of learning. During the post-mortem, we were asked to describe our experience or what we had learnt using three words. While the others answered with words like ‘enthusiastic’,’exciting’, ‘challenging’, ‘inspirational’ and ‘good role model’, all I could think of was ’emotional’. It’s amazing how, when teaching, even in just the span of three hours, one can see changes in children. From reserved, slightly intimidated students, they were transformed into enthusiastic learners, excited about their project and wanting to do their best. From strangers, they became my children for that three hours. 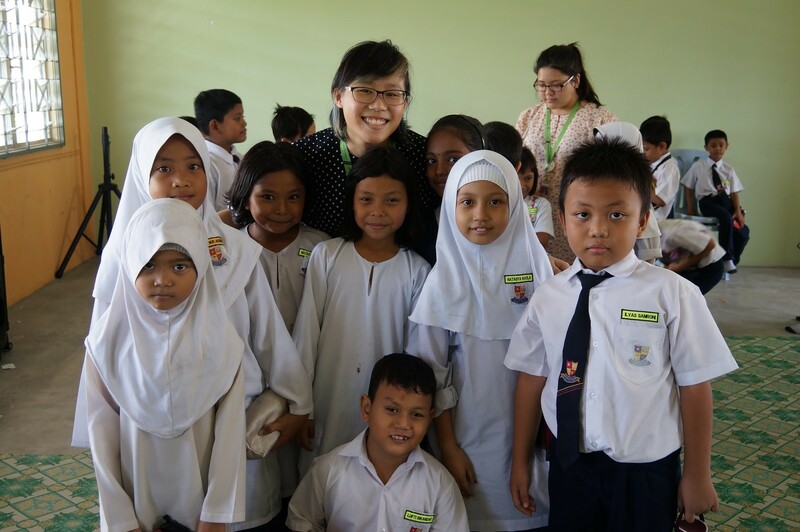 It was so heartbreaking to hear them asking, ‘Teacher, esok ajar lagi ya (teach us again tomorrow, alright)?’ ‘Teacher, bila datang lagi (when are you coming again)?’ ‘Cikgu, cikgu jadi cikgu baru kat sini ke (Teacher, are you a new teacher here)?’ knowing that I might not be able to go back again. I hope that I did start a spark, no matter how small, of the love for learning and the belief that you can learn. Remember this moment where learning is no longer a chore, where it becomes something you want to do, where it is something you can do. Children are capable of so much. There is a huge load of potential in them, just waiting for the right moment, the right person to come along and release it. Yet we look down on them. We label them according to their socioeconomic background, their school, anything at all that makes them different from what we know as ‘normal’ or ‘good’. We deem them unteachable, giving up on them before we have even tried putting in the slightest bit of effort. Please give all children a chance to love learning and to truly learn. Please don’t judge them merely by the school they come from. Please believe in them and support them. Create learning moments for them, help them believe that they can learn. Believe in them, create learning moments for them, and they will believe in themselves. Tags: education, learning, My Big Book, Social Action Plan, social work, teaching. Bookmark the permalink.